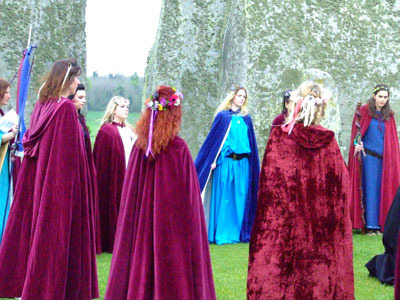 May Day is Beltane, which means ‘day of fire’. It is an ancient Pagan festival. Bel was the Celtic God of the sun. May Day marks the seasonal transition from Winter to Summer and celebrated the first spring planting. 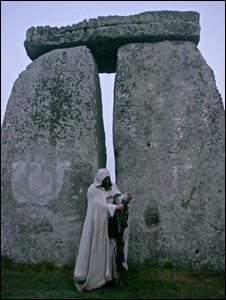 May Day is Beltane, which means ‘day of fire’. It is an ancient Pagan festival. Bel was the Celtic God of the sun. May Day marks the seasonal transition from Winter to Summer and celebrated the first spring planting. Putting a Maypole up involved taking a growing tree from the wood and bringing it to the village to mark the coming of Summer. Single men and women would dance around the Maypole holding on to ribbons until they became entwined with their (hoped for) new loves. Social hierarchy was set aside on May Day to involve everyone from the highest to the lowest. May Day is a celebration of fertility. In the old days whole villages would go to the woods and all sorts of temporary sexual liaisons would take place. Robin Goodfellow, also known as the Green Man was the Lord of Misrule on May Day. He and his supporters would make jokes and poke fun at the local authorities. Parliament banned May Day festivities in 1644. Unlike Easter, Whitsun, or Christmas, May Day is the one festival of the year with no significant church service. In previous centuries working people would take the day off to celebrate, often without the support of their employer. William Davidson, a black trade unionist and a revolutionary, was executed on May Day 1820. Davidson was born in the then pirate capital, Kingston, Jamaica and put a skull and crossbones on a black flag to say:“Let us die like men and not be sold like slaves.” He was executed for being part of a conspiracy to kill the entire cabinet, which was hoped to give the spark to a revolution in Britain. May Day is recognized throughout the world as International Workers’ Day, or Labour Day. In 1884 US and Canadian trade unions declared that after May 1st 1886, 8 hours would constitute a legal days work. May 1st was declared a holiday by the International Working Men’s Association (First International) in Paris in 1889. This was to commemorate the Haymarket Martyrs of 1886: 8 anarchists were wrongly accused of throwing a bomb at police and 4 were executed. The USA and Canada do not recognize May Day. The US government attempted to erase the its history by declaring that May 1st was ‘Law Day’ instead. They pronounced that Labour Day was to be on the first Monday of September, a date of no significance.